Predator-proof housing is essential for chickens and other small animals such as domestic ducks and rabbits. Unfortunately, many well-meaning folks who do not realize this can embark on raising chickens, install them in unsafe housing, and experience the trauma of having their pets massacred by predators. Sadly, it is a very common scenario, one that can be prevented. Secure your chickens in predator-proof houses during the night, and give them access to a predator-proof outdoor coop (yard) during the day. Safe housing for chickens will protect your chickens from predators such as raccoons, opossums, skunks, dogs, hawks, coyotes, foxes, bobcats, and mountain lions. All of these animals are hungry and looking for food. Raccoons, for example, are good climbers and strong animals who will seek open, weak, or loose places in your chicken house and outdoor chicken yard. Chickens must be locked up safely in a secure chicken house every night at the beginning of twilight when they go to roost for the night. If you arrive home after twilight and then plan to lock them up, it may be too late for your pets. Several of chickens’ most common predators are nocturnal. A secure chicken area needs to have four sides, a roof, a chicken house with a cement pad or cement paver floor, and doors on the both the chicken house and the chicken yard that can be latched tightly. The latches should be safety hooks or locking hasps, because raccoons can successfully manipulate and open simple door latches. Locate the coop near your house so that you can keep close watch and take quick action if trouble occurs. Vigilant chicken owners often install baby monitors and even security cameras in their chicken coops. If you hear a clamor, run to the chicken area as fast as you can. Do everything possible to prevent your chickens from being torn apart by raccoons or other animals. Such incidents can traumatize your family. Raccoons remember where they found food. If they have had access to your chickens before, check every inch of your chicken area for weak spots where they could re-enter. Teach your local raccoons that your chickens are inaccessible. Then they will look elsewhere for food. The Chicken Chick and Sonoma County Wildlife Rescue both offer ideas for predator-proofing outdoor chicken coops. Sonoma County Wildlife Rescue also includes information on safe housing for domestic rabbits, ducks, and geese. The frame should be set firmly into the ground. All wire is fastened tightly to the frame with washers and screws, not staples. All wire that attaches to other wire has a generous overlap and is fastened tightly with washers and screws. See Photo #1. Fencing should not have openings large enough for a raccoon to reach through and grab a chicken. The safest is 1⁄4” hardware cloth. The openings in most welded wire are too large to block predators. If the openings in the wire are larger than 1”x1,” double fencing is needed to block predators. If the first layer is 14 gauge 1”x2” welded wire, the second layer fencing of wire over the top of the first layer fencing must have much smaller mesh, such as 1/4” hardware cloth. See Photo #2. A trench 12” deep and 12” wide is dug around the chicken house and coop to block predators who dig (such as dogs, coyotes, foxes, and skunks). Four-foot wide hardware cloth is attached at a height of 24” to the outside perimeter of the coop. The remaining 24” of hardware cloth goes straight down into the ground for 12”. The last 12” of hardware cloth is bent in an “L” shape (90° angle) so that the foot of the “L” extends away from the coop and chicken yard. Concrete pavers are also placed in the trench when the underground fencing is installed. After wire and pavers are placed in the trench, it is filled with soil and tamped down. See Photo #3. 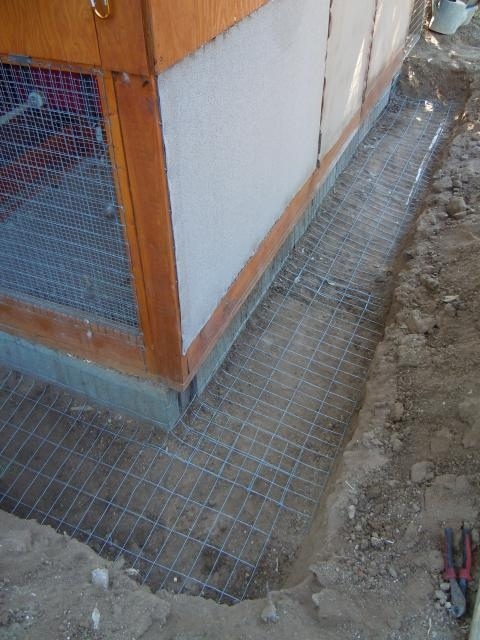 The chicken house has a cement pad floor to block predators from entering by digging under the walls from outside. Alternatively, concrete pavers can be used as flooring in the chicken house. 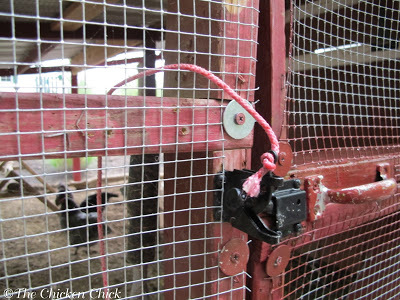 Use 1⁄2” hardware cloth fastened tightly to the vertical fencing of the coop. The latch requires multiple steps to open. Raccoons can easily open simple latches such as a hook and eye latch and handles. See Photo #4. A practical and economical option for fencing the chicken area is to enclose it with prefabricated, sturdy chain-link panels. 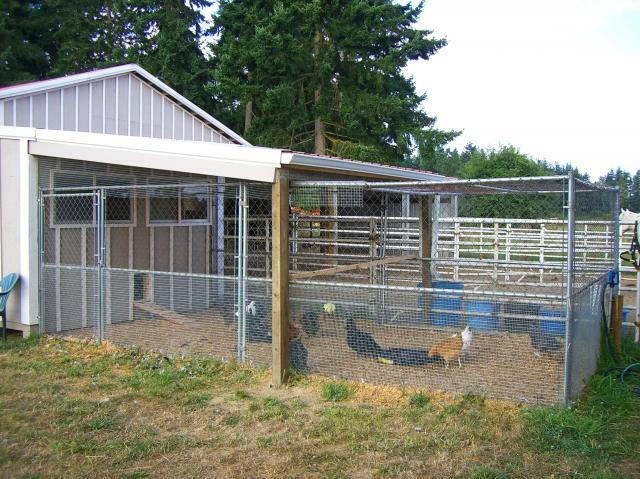 At building supply stores, chain-link outdoor kennel kits intended for dogs can serve as basic enclosures for chickens. For example, at Home Depot one kennel kit with a label that says “endorsed by the American Kennel Club” is made of galvanized steel chain-link wire. It measures 6’ wide x 10’ long x 6’ high and costs about $200. The kit includes a door and has enough vertical space for people to stand inside it. Do not choose a kennel that has a large space between the bottom of the door and the ground. Look for a kennel that has only a very small space below the door. Then lay concrete pavers to close most of the space. The pavers will block predators who dig. 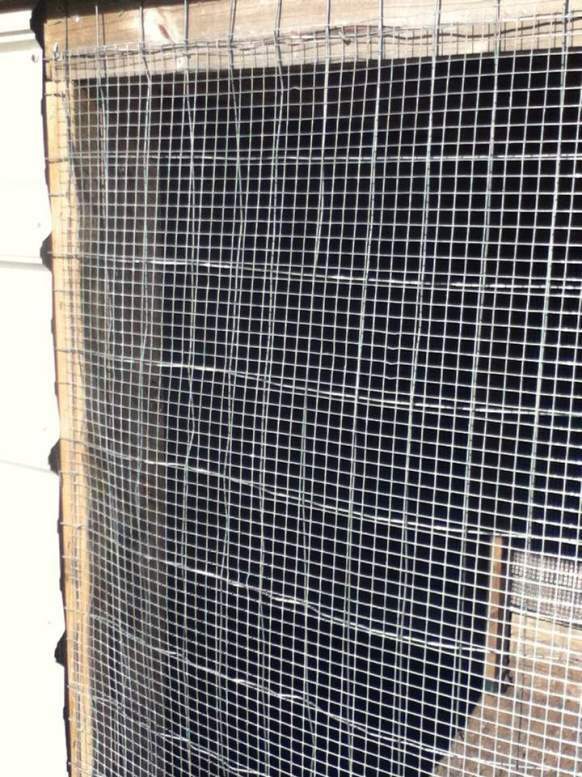 If you use a chain-link fence or kennel as your primary fencing for the chicken yard you will need to attach 1/4” - 1/2” mesh, 4-foot wide hardware cloth to the outside bottom perimeter of the chicken yard to prevent raccoons from reaching through the chain-link openings and grabbing any chickens that they can reach. Reinforcing the perimeter of the chain-link kennel both above and below ground with another layer of fencing will also deter predators who dig. After installing the chain-link kennel, dig a trench 12” deep and 12” wide around the chicken area. Firmly fasten two feet of a 4-foot wide roll of hardware cloth above ground to the outside of the lower part of the chain-link fence. The remaining 2 feet will go straight down into the ground for 12 inches, then bend like an “L” (90° angle) to extend horizontally underground away from the chicken yard for another 12 inches. (See #5 above.) Add concrete pavers underground to block digging by predators such as dogs, coyotes, foxes, and skunks. Concrete pavers are especially needed under the doorway to the kennel. Then fill the trench with soil, and tamp it down firmly. Remember to install a secure wire roof of 1/2” hardware cloth over the chicken yard. Fasten it very tightly to the vertical fence. Raccoons are good climbers. Hawks and other predators can attack chickens from above. By providing safe housing for your chickens you can look forward to enjoying them for many years.